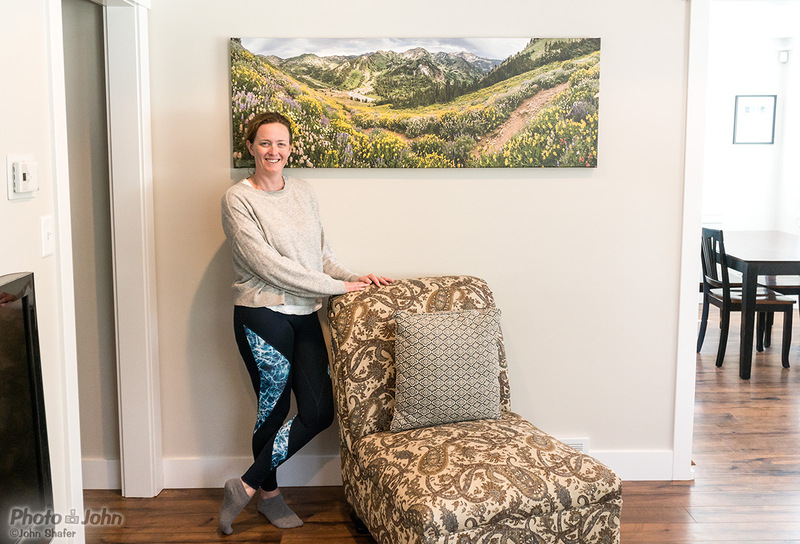 Alyson and the big, 60-inch panoramic canvas photo print her family gave her for Mother’s Day. I LIKE BIG PRINTS AND I CANNOT LIE! Do you like big landscape photos, too? Alyson loves the 60-inch panoramic canvas wrap her family gave her for Mother’s Day. This beautiful big landscape photo print was made from three stitched images I shot last summer in the mountains above Salt Lake City. The wildflowers were going crazy and the dramatic skies and snowy mountains made a truly beautiful and memorable scene. 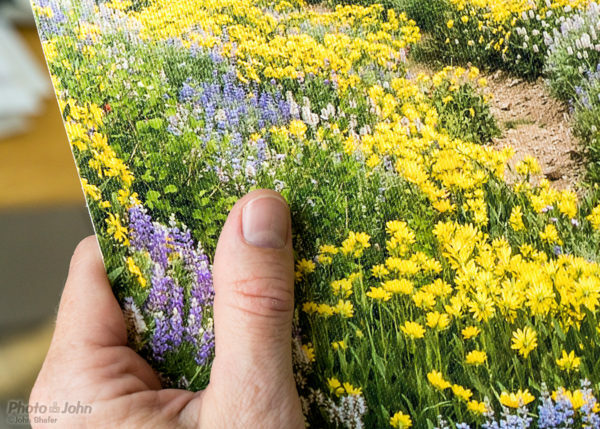 We’re getting close to peak Wasatch wildflower season again and I’m looking forward to making some more big panoramic images like this one. Canvas is a great material for big landscape photos. Here’s a close-up of a canvas photo print to show the texture and detail. This is actually a full-size test print of the final panoramic image at the top of this page. Bring the serenity and beauty of the outdoors into your home or office. If you have some empty space on the wall of your living room, office or business, I have all kinds of beautiful big landscape photos that will help brighten up and complement the space. Canvas wraps, like the panoramic print Alyson got for Mother’s Day, are a great way to mount a big landscape print. The canvas texture adds a painterly touch to the photo and the wrapped frame matches any space or décor and is easy to hang and display. If you’re interested in having your own big landscape photo print, panoramic photo or canvas wrap, you can check out more of my landscape photography in the Photo-John Fine Art Print Store. If you see a photo you like, it’s easy to order directly from the online store. However, if you’d like a size that isn’t offered or you’d like to see more images, contact me and we can discuss custom sizing, alternative print surfaces or other image options. I have thousands of landscape photos in my archives so I probably have something that you’ll like, even if you don’t see it in the online store. A panoramic photo taken looking south across Little Cottonwood Canyon at Alta Ski Area.